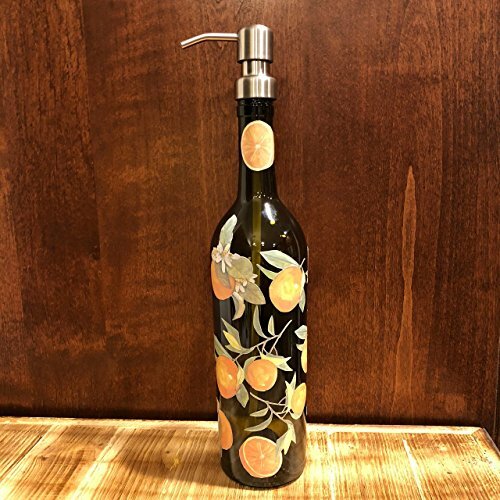 This soap/lotion/sanitizer dispenser is made from a real recycled wine bottle! The brushed metal dispenser looks professional and expensive compared to small plastic dispensers that are typically found in stores. And unlike many wine bottle soap dispensers, which are just an olive oil pourer stuck into a bottle, I use a real soap dispenser that is modified by hand to fit each bottle securely. The tube reaches the bottom of your bottle so you will refill less often. The artwork is an orange watercolor transferred onto waterproof vinyl, printed with waterproof inks and is attached to both sides of the bottle. Choose brushed silver or brushed bronze soap dispenser. Bottle does NOT come with soap. If you have any questions about this product by WineLadyCo, contact us by completing and submitting the form below. If you are looking for a specif part number, please include it with your message.